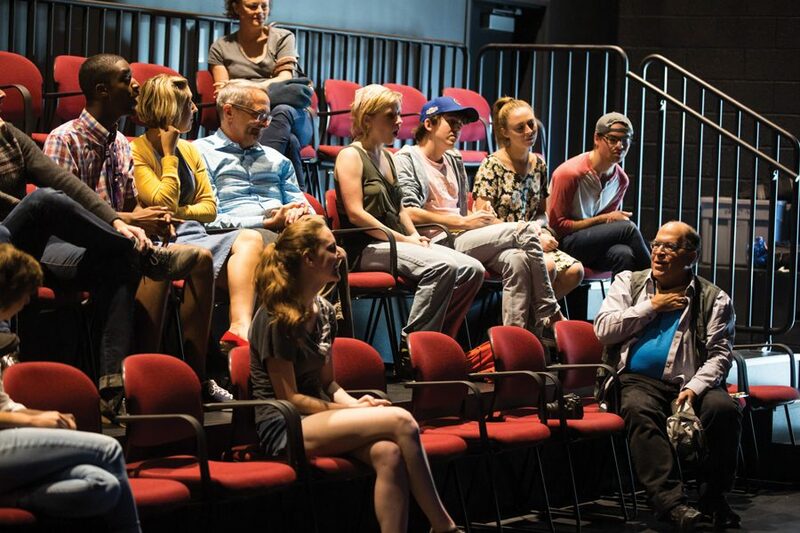 Audience members attend the workshop for “Digging up Dessa.” The play, written by Communication Prof. Laura Schellhardt and directed by Communication Prof. Rives Collins, will premiere Feb. 3 at The Kennedy Center in Washington. The tongue twister “she sells seashells by the seashore” has tripped up many a novice actor during warmups. But despite influential paleontologist Mary Anning possibly being the subject of this infamous saying, many people have never heard of her. Communication Prof. Laura Schellhardt said she developed her latest play, “Digging Up Dessa,” with a desire to shed light on empowering figures — like Anning — who are often left out of contemporary conversations about history. “I became obsessed with this idea that there are women in history in every canon — not just in science, not just in math, certainly in theater — that no one’s talking about who made grand contributions to the field and are only not being spoken of because they’re women,” Schellhardt said. The play tells the story of Dessa, a junior high student who works to get Anning more public recognition after a trauma that causes her to hallucinate Anning’s physical presence in her life. It is set to premiere Feb. 3 at The Kennedy Center in Washington. The writing process began as a result of Schellhardt’s interest in Anning’s experiences as a woman in paleontology, she said. Two and a half years after beginning her research, Schellhardt received a commission from The Kennedy Center to develop a play for the Women’s Voices Theater Festival in Washington. Schellhardt previously worked with The Kennedy Center on another play, “Ever in the Glades,” as part of its New Visions/New Voices 2016 theater festival. Kim Peter Kovac, artistic director for The Kennedy Center’s Theater for Young Audiences program, said he knew of Schellhardt’s talent from previous work she submitted to the center. So, when it came to finding new playwrights to collaborate with, Kovac said the team immediately thought of her. “We hire artists because we believe in them, so we try to support them and stay out of their way so they can do their own work,” Kovac said. Schellhardt and director Rives Collins initially did a reading of “Digging Up Dessa” for the advanced drama class at Haven Middle School in Evanston. There, Collins said they received feedback from students on the accuracy and relatability of the piece, which is targeted toward young audiences. Both Schellhardt and Collins have a strong background in creating shows for young audiences. The piece then moved to Northwestern, where actors had five days to rehearse the show before a reading last Saturday. During this time, Schellhardt constantly brought in new pages for the script and made edits to it, said Communication senior Shea Lee, who read for the title character of Dessa. While Schellhardt initially imagined Dessa as a high school or college student during her early research, The Kennedy Center requested Dessa be 12 or 13 years old to reach a target audience of girls in junior high, she said. Schellhardt added that she hopes this show will help young people by presenting female role models in a traditionally male-dominated industry, like the science, technology, engineering and mathematics fields. Collins said he believes Theater for Young Audiences is an important vehicle for starting dialogues with young people and encouraging them to connect with each other.